I love both of these...the video makes the US look like a black hole sucking up the rest of the world. 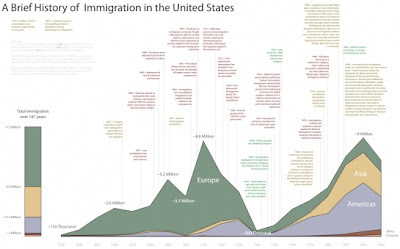 Although probably not technically immigration, the chart does not address the influx of African slaves and the chart, therefore, does not give an accurate picture of national origins. True, but by 1820 the slave trade had been banned in the U.S. and it would be difficult to know how many slavers and how many captives slipped through the blockade. One estimate I've seen puts the number of arriving Africans at 1,000 per year between 1807 and the Civil War.